Scrubbing tower with Ring Jet technology. Whether a facility is generating flue gas from incineration of wastewater treatment sludge, medical hazardous waste, pulp and paper, or foundry processes, if a scrubbing technology is not aggressively removing particulates, it will not be compliant with existing regulations. A wet scrubber system makes contact with target compounds or particulate matter with a scrubbing solution, pulls the contaminant out of the flue gas, and carries the pollutants away in a liquid stream. The solutions may simply be water, for dust, or solutions of reagents that specifically target certain compounds. Conventional wet scrubbing systems utilize a quench which delivers a cooling effect, and venturi technology which controls fluid flow and velocity through a constricted section of the scrubber. A singular, large venturi device is utilized to create a spray of solution or water, which then traps the pollutants. In conventional wet scrubbers with venturi systems, that spray is more of a rain, with the droplets being of a larger size. The volume of particulate removal, however, is directly related to the surface area of the droplets, as well as temperature and viscosity. For any given volume flow of water or solution through the system, the bigger the droplet size, the less surface area is extant to contact and remove particulates. Hence, conventional wet scrubbing systems have been limited in their function to clean particulates from flue gas streams. 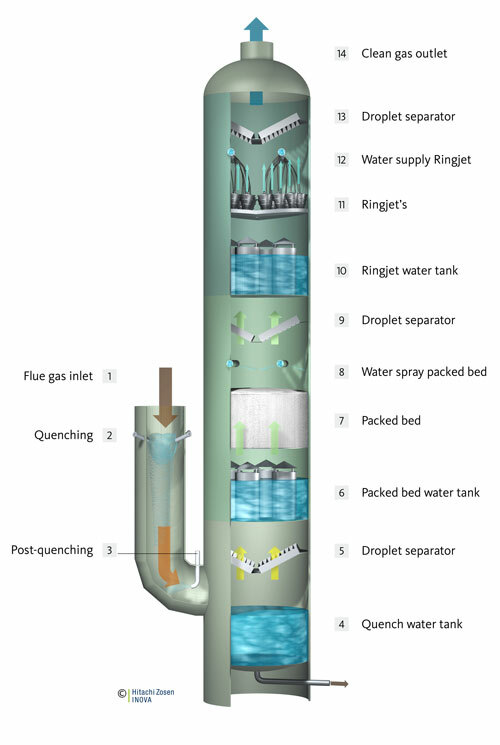 Diagram of the Ring Jet flue gas multistage wet scrubber process. Click to enlarge. The ability of wet scrubbing systems to attract and remove particulates and other pollutants, has been greatly expanded through the application of Ring Jet™ venturi scrubber technology, developed by Hitachi Zosen Inova. It consists of a variable throat bomb bay door quench, packed cooling and conditioning tower, an optional pH-controlled caustic absorption section, a proprietary Ring Jet venturi, followed by a sorbent polymer composite (SPC) mercury removal system. Each of the process stages are optimized for a particular pollutant, such as acid gases, particulate, heavy metals, etc. Heavy metals and aerosols, for example, are removed without any need to be concerned about load fluctuations. The quench section of the scrubber has two functions. The first is to cool incoming gases to their saturation temperature. The second is to capture the majority of the incoming particulate coming from the combustion system for collection and disposal. Particulate removal efficiency, and to some extent gas cooling, is controlled by the degree of turbulence and intimate gas-to-liquid contact that occurs in the venturi section of the quench. That section is fitted with adjustable bomb bay doors. By opening or closing these, the throat area will change, thus decreasing or increasing, respectively, the turbulence and droplet surface area in the throat. It is this turbulence that creates the gas-to-liquid contact required for particulate removal. The venturi pressure drop measures the degree of turbulence. The pressure drop is controlled by modulating the bomb bay doors automatically to maintain it at the set point. The purpose of the packed tower (cooling tower) is to subcool and condition gases prior to sulfur dioxide (SO2) absorption and fine particulate collection by the Ring Jets. Subcooling increases water viscosity, thereby increasing the droplet surface area. The flue gas flows vertically upward through the packed bed stage. 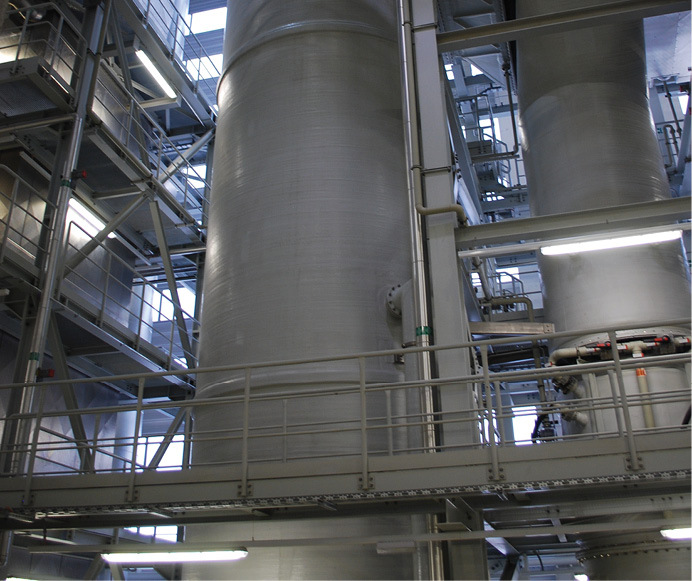 Plant effluent water is sent into the top of the packed bed section via the packed tower flow control valve. The packed bed consists of several cubic feet of packing structures, which fill the entire cross section of the vessel. The packing creates channels, which provide contact between the flue gas and flush water, and also allow the flush water to absorb the SO2. Drainage from this stage flows into the plant’s return water system. From the packed tower, the saturated gases go to the SO2 gas absorption section. The remaining SO2 is removed in the absorption section. Plant effluent water is mixed with sodium hydroxide (NaOH), and pumped to the top of the absorption section. In order to remove SO2 from the flue gas, the pH of this effluent/caustic mixture is maintained at a concentration level between 6.5 and 7.0. The existing pH and control and caustic blowdown will be modified to assure reliable control of SO2 capture. Two existing wet scrubber caustic pumps will be used to recirculate caustic through the gas absorption section. the centre of the Ring Jet inner cone, collides with an impingement plate causing the water (water mist with submicron dust particles and aerosols) to flow radially outward to the outer cone of the Ring Jet (angled blue arrow at top). Clean gas exits the Ring Jet separately (vertical blue arrows at top). After leaving the SO2 absorption section of the wet scrubber, flue gas flows upward to the Ring Jet stage. Flue gas leaving the second stage passes through a separation floor before entering these. This third and final stage of gas scrubbing is comprised of a multiple of venturi-type Ring Jets for the removal of submicron particulates and aerosols. Instead of a singular, large venturi-effect sprayer, Ring Jet venturi technology employs anywhere between five and 20 smaller venturi jets, positioned in parallel. These create a much smaller netting of droplets, which significantly increase the overall droplet surface area – given the same flow rate and volume of water or solution as with conventional wet scrubbers – thus attracting more particulates and contaminants. The entering gas stream is divided into a number of smaller streams. These are forced through the individual Ring Jets. The particulate in the gas stream is forced to come into intimate contact with the scrubbing fluid, resulting in capture of the particulate by the fluid. The film of scrubbing fluid covers the mouth of the Ring Jet, thereby completely eliminating shortcutting or bypassing. 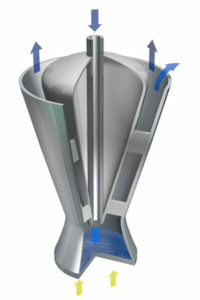 The scrubbing fluid film is created by a stream of water, flowing counter-flow to the gas stream from a port cast in the centre of the Ring Jet inner cone, and colliding with an impingement plate. This causes the water to flow radially outward to the outer cone of the Ring Jet. The liquid flow rate to this stage will be controlled in response to the gas side pressure drop. This feature allows for a constant operating pressure differential across the stage and, therefore, constant removal efficiencies at different flue gas flow rates. The exit duct from the wet scrubber includes a demister. The demister captures any droplets of spray from the Ring Jets which may be remaining in the exiting flue gas. In between each of the different stages, and at the exit of the scrubber, there are combinations of separation floors and/or demisters. The separation floors are used to collect the spent waste liquids in each stage so that they can be recycled back into the system after treatment. Demisters are used to prevent the carry-over of moisture entrained in the flue gas. In situations where no wastewater is acceptable, the Ring Jet process provides a closed cycle, where the scrubber blowdown can be pumped into the spray dryer, and sprayed into the hot flue gases. The mercury control system (MCS) consists of stacks of static absorption modules located after a particulate collector in an industrial flue gas application. The modules are arranged in layers to cover the cross-sectional area of the gas flow. This mercury removal technology is based on a sorbent polymer composite (SPC) material, containing sorbents and catalysts in a highly hydrophobic porous structure. The SPC is formed into flat and pleated sheets, and placed into a Hastelloy C-276 frame to form each module. Gas flows through the channels formed by the pleated and flat sheets, allowing for minimal pressure drop. Continuous gas temperatures should be below 180oF for optimum mercury removal performance. Gas phase mercury is chemically bonded within the SPC material. In addition, MCS converts SO2 in the gas into aqueous sulfuric acid which falls into the scrubber absorber vessel below. The sulfuric acid, formed as a product of SO2 removal, helps to wash the SPC surface. The acid washing action, along with the smooth, low-friction texture of the polymer-based SPC, makes the module resistant to fouling and deposition by process dust. In addition, a water wash system is typically installed below and above the modules for intermittent operation to provide further protection from fouling. Ring Jet scrubbers have demonstrated high particulates removal rates – up to 99.99% – and they can eliminate the need for a wet electrostatic precipitator. The process has no moving parts. It is simply a step-by-step process which eliminates different constituents in different stages. These advantages not only allow the plant to operate a robust and reliable system, they also reduce operating and maintenance costs substantially. Joe Szczepkowski is with Hitachi Zosen Inova USA LLC. This article appears in ES&E Magazine’s October 2017 issue.